U.S.E.I.A. Note: the downturn in 2007 to present reflect high fuel prices and economic recession, not a change in import pattern--see graph below. The top graph shows the quantity, and the second one shows the price. To see what the nation is spending, we need only multiply quantity times price. For simplicity we will focus on only the most recent decade, using data from the Energy Information Agency of the Department of Energy. The table below shows the quantity times price for each December for the past 10 years, along with the yearly total. For 2009-2010, amounts are shown monthly. Table by David Foster, RAIL Solution, drawn from data at U.S.E.I.A. The table shows that the annual cost (in $1,000s) of imported oil to the nation rose steadily from around $100 billion annually in the early years of the decade, to top out at over $400 billion in 2008. The economic downturn in the past few years has had a dampening effect on world oil prices and consumption, but monthly import costs have trended upwards again since December, 2008. Even with increased domestic petroleum production, in 2013, the U.S. still imported half the oil it burned. Looking to the future, an ongoing annual expenditure in the neighborhood of $200 billion for imported oil seems plausible. Think about seven percent of that total being $14 billion annually. Keep in mind that the world price still determines U.S. petroleum costs despite recent domestic oil production gains. As shown in the Oil-Free Mobility section of this website, the Steel Interstate has the potential to save 7% of the nation’s oil consumption when just 50% of the mid- to long-distance freight now moving by truck has been switched to the core national network of electrified railroads. By moving more than half of the nation's over-the-road trucking to electrified rail additional billions of dollars of oil will no longer need to be imported each year. Passenger traffic on the Steel Interstate will further displace need for oil imports. The cost of the Steel Interstate per mile of construction will vary considerably with many variables such as terrain, land use, density of settlement, and number of bridges and tunnels on a particular segment. Absent a lot more engineering work, there is no way to know how much the Steel Interstate will cost. However, based on work done in the 600-mile I-81 Corridor between Knoxville, TN and Harrisburg, PA, where rebuilding the current Norfolk Southern single-track rail line to Steel Interstate standards involved an estimated cost of $9 billion, a cost of $15 million per mile may be indicative of the overall national experience. Using that example as a yardstick, the $28 billion in imported oil savings each year would fully pay for (or repay the cost of) 1,867 miles of Steel Interstate [$28 billion ÷ $15 million = 1,867]. Nationwide the projected Steel Interstate System would approximate 35,000 miles. Oil savings alone would pay the cost of the system in 18.75 years. If oil prices were to resume their steep upward climb following the recession, the payback period could be much shorter. And, of course, the savings would go on month after month, year after year, even after the initial investment in the Steel Interstate System is recouped. We do not to attempt to calculate as an offset to these savings the cost of the 1% increased electrical use. The 1% is minor and could easily be met through implementing utility end-user energy-efficiency programs that have no net cost at all. Further, the electrical cost would be a railroad operating cost and not an impact directly shouldered by the citizens, unlike the nation’s trade deficit. In fact, the result would be a railroad, cheaper to operate , which would offer producers, shippers, and consumers higher productivity at lower costs, benefiting all. You can find out how, and more about how much, energy the Steel Interstate System, can save in the Oil-Free Mobility topic section. As you will read there, trains are far more energy-efficient than trucks or cars. Oil-Free Mobility explains how electric locomotives are much more efficient in converting fuel to energy than either diesel locomotives or trucks or gasoline-fueled cars. One exceptionally important way that savings on fuel will increase overall American productivity is that some of the billions of dollars formerly spent on imported oil will be spent at home on domestic renewable energy. As you will read in Incentives For Renewable Energy, the Steel Interstate System can play a significant role in bringing remote wind and solar energy to market by transmitting the power along certain rail rights of way. The renewable energy will be made available to all of us, while powering a new, fast continental freight and inter-city passenger rail system. Accessible transmission will accelerate growth of renewable energies just at the time we need them for economic development and to minimizes the ravages of climate change. Here is a graph that depicts the importance of oil imports (black line) as a major contributor to pushing up the trade deficit (blue line). The red line is the international deficit without including oil imports. 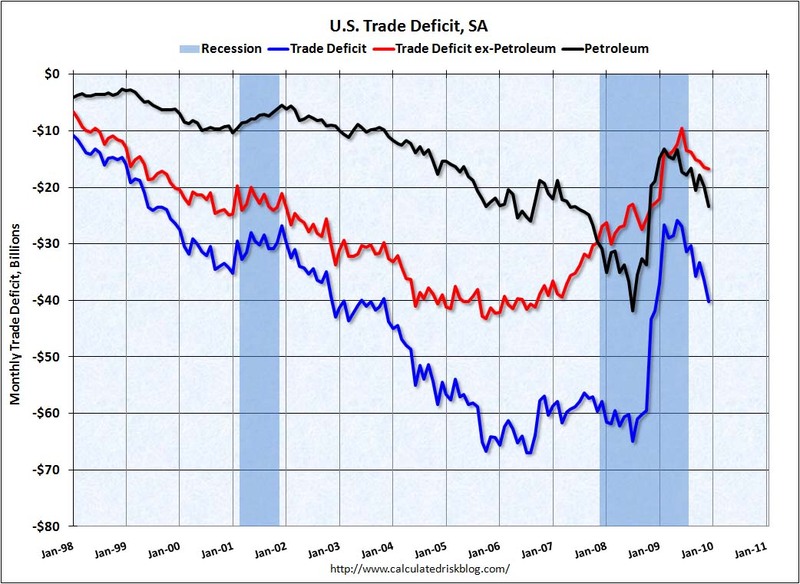 Notice the trade deficit line mirrors the trend set by petroleum imports. Loss of 2,241,000 jobs in the U.S. resulting from these "investments" outside the U.S.
We have seen that the June, 2010 trade deficit was $50 billion, and that oil makes up about half, or around $25 billion. A 7% reduction represents $1.75 billion or 47,250 jobs using the DOE relationship. Keeping America’s money at home building infrastructure, creating and protecting jobs, fostering growth, and developing new opportunities for American workers is one of the great economic benefits of the Steel Interstate. That 7% imported oil savings will multiply into big economic dividends as reducing imports enhances our nation's international balance of payments, strengthening the dollar as the world's reserve currency and making all other imports cheaper. Less fuel used to deliver parts and finished goods throughout North America will increase national productivity with many benefits to business and consumers, rippling across the economy. As you will read further in in other parts under this Economic Dividends section, the Steel Interstate System offers numerous opportunities to boost the economy both in macro terms, like this instance, but also for micro-enterprises, even family economies.